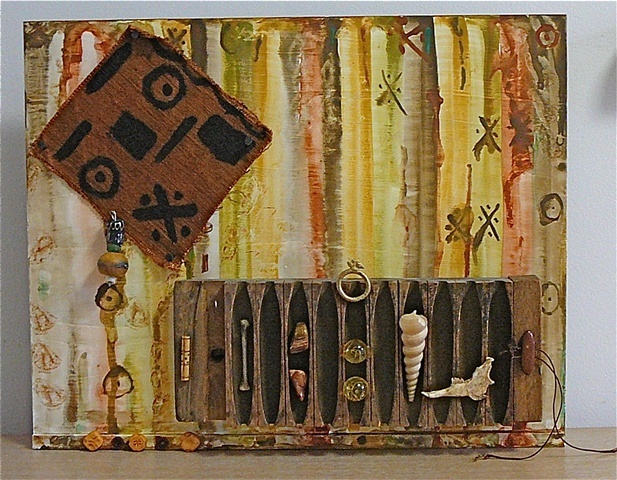 mixed media on wood: watercolor paint, mud cloth (made by me), animal bone, animal jaw bone, shells, nails, marbles, stones, cigar mold, african fetish ring, bone, beads from africa. Most profound work. I am very much a fan of all materials used in it. there's something about this picture I can't really explain. At first glance it's very beautifully naive, but then there's also something below the surface, something that stays with you. Wonderful color in this work of yours!!!! !